I haven’t baked a bread in a long time so decided must bake one before I forget how to knead the dough and bake a bread. Really does one forget certain skills? I don’t know, yes my language skills are bad so no wonder there are so many french verbs and words I have forgotten. During our visit to Montreal, reading the language everywhere was not so much a problem as speaking it. The right words would not come to my mind at the right moment. They had a knack of appearing in my mind when least wanted, like at night! However other skills like cooking, driving a car, teaching etc, I will not forget.Maybe it is because I really enjoy those skills. Anyway,coming back to breads, I was tempted to bake one from my recipes already posted and then went through my “to try” list and thought, gosh I need to shorten this! I still haven’t managed to try all the recipes I have collected from magazines, newspapers and tv shows and here I keep on adding more! 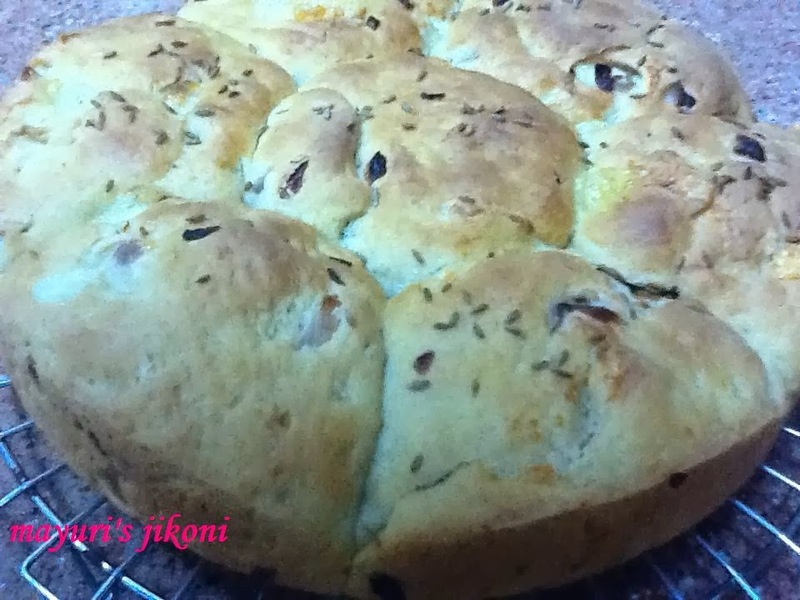 So I decided to bake a cheese and onion bread which would go well with the tomato carrot soup I was going to make for dinner.This recipe was from an old Bella magazine. As I always say,the bread tasted better the next day as I could actually taste the cheese and onion. However, just out of the oven the freshness of the loaf was delicious. Heat the oil in a wide pan over medium heat and saute the onion till it is slightly soft. Let it cool. Mix the flour, salt and sugar together. Add the yeast and form a dough using the warm milk. Using extra flour, knead the dough for nearly 10 minutes till it is smooth and silky. Check out the technique for kneading bread dough here. Add the cooked onion and knead it into the dough. Form a big ball and rub a bit of oil over it. Grease a big bowl with a bit of oil. Place the dough in the bowl. Cover it with a plastic sheet or cling film and put it in a warm place. Let the dough rise till it becomes double the size. This may take about 2 hours. Gently knead the dough again. Add the cheese cubes. Using oiled hands, shape the dough as you like. I used a round 9 inch cake tin. Grease the pan or tray and place the dough on it. Let it rise again for about an hour or so or till the dough is double size again. Sprinkle a bit of water over the top of the dough or apply egg wash or milk. Place the dough in the hot oven to bake for 25 to 30 minutes. It is done when the top is golden brown and if tapped gently, it sounds hollow. Remove the bread from the pan or tray and let it cool on a wire rack. Egg wash is about 2 tbsp of water or milk mixed with an egg. I added a tsp of cumin seeds for extra flavour. You can use any cheese of your choice. I used mozzarella cheese. If you want a normal loaf shape, then use a 9×5 inch loaf tin. For a slightly chewy crust, sprinkle or brush water on top of the dough before baking. If you are using dry active yeast which is not the instant variety, remember to let it activate in the warm milk for about 10 minutes before adding to the flour.